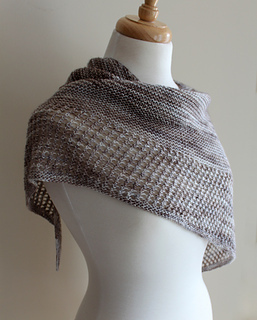 Looking for an elegant yet simple shawl to wrap around your shoulders on a summer evening? Or to keep your neck warm on a fall or winter day? 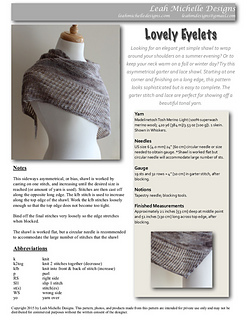 Try this asymmetrical garter and lace shawl. 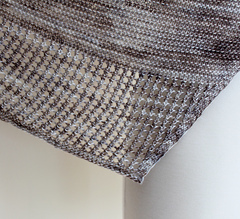 Starting at one corner and finishing on a long edge, this pattern looks sophisticated but is easy to complete. 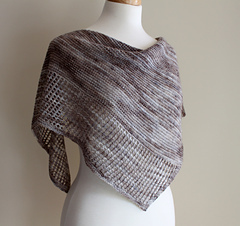 The garter stitch and lace are perfect for showing off a beautiful tonal yarn. 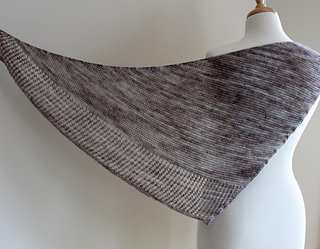 This pattern uses one skein of Madelinetosh Tosh Merino Light. The sample is shown in Whiskers. Finished measurements: approximately 21 inches (53 cm) deep at middle point and 51 inches (130 cm) long across top edge, after blocking. 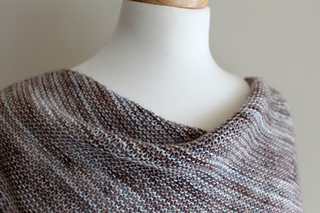 Skills required: increasing, decreasing, basic lace, blocking. Stitches used: k, p, sl1, kfb, k2tog, yo.